For an awesome vacation in Gatlinburg/Pigeon Forge, TN, book lodging at the Black Fox Lodge. This accommodation option features some fantastic amenities and perks that make it a must-have choice for your Great Smoky Mountain getaway. Located in the foothills of the gorgeous Great Smoky Mountains, there truly is no better location for a relaxing getaway than the Black Fox Lodge. Here, guests can enjoy stunning mountain river views and enjoy the views of one of the most notable landmarks in the country. Relax around the fire pit and enjoy the stars or take a dip in the seasonal outdoor pool and soak up the sun. Outdoor adventures are the highlight, but that doesn't mean the hotel itself isn't chock-full of awesome amenities. Once inside, guests will find various amenities that can help make their hotel stay comfortable. Stay connected with friends and family with the free highspeed WiFi. There is also meeting space and a 24-hour fitness center for those who are working on the go. Guests can also take advantage of onsite laundry. Once you work up an appetite, head to the onsite restaurant and bar. Each day, the Black Fox Lodge serves up breakfast featuring hot breakfast favorites. Located at the Fox Den, this breakfast is served 7 AM - 10 AM. Then, from 4:30 - 10 PM, the Fox Den turns into a dinner hub with a bar. Guests can get pizzas, burgers, and more with awesome local beers on tap and mixed cocktails. After spending time enjoying everything that the Black Lodge has to offer, return to your comfortable room which allows you to relax and unwind. 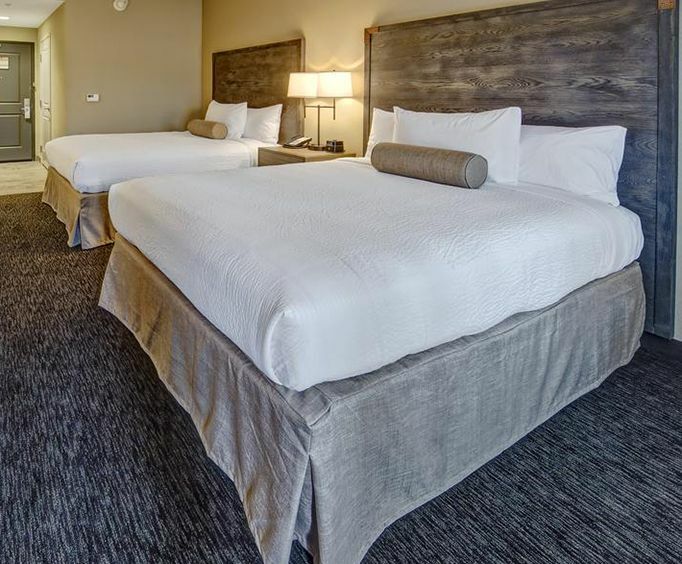 Each room features free WiFi, a coffee maker, iron and ironing board, a microwave, mini-fridge, and a 42-inch LCD TV so you won't miss out on your favorite shows. There are so many awesome things to experience in the Great Smoky Mountains. Be sure to have a great time relaxing and unwinding with a Gatlinburg getaway. Lodging at the Black Fox Lodge is a must.